There are 3 reasons why we didn't go to The Hearth at Greenpoint. They are more expensive, there wasn't an immediate opening, and for the most part, they're much bigger a community; I think my folks would have been kind of lost in there. It would have been too big for them to get used to immediately and to get around. Nevertheless, it is a beautiful setting. I really like the place. I liked everything about it when I was there looking it over. The grounds are OK, but there is little room to walk around. It is fairly small ground-wise; it's what you would expect in the middle of the city. I would recommend them though. Dear Bruce, thank you for taking the time to write a review and provide feedback of your visit. We are sorry to hear that your parents won't be joining us. While it can seem like a large community at first, the staff, activities, and atmosphere strive to make it feel like home. Please let us know if there is anything that we can do for you in the future. Thanks again, Mark Guida, Executive Director. The Hearth at Greenpoint was very nice. I would give them a 5 because of their location. It had outdoor spaces, and the inside accommodations were a little bigger in square footage than other places. My sister has moved to The Hearth at Greenpoint. We were very impressed with the place. The accommodations were great, and it was very clean. We like the staff, and we like the whole setup of the place. They offer a lot of enrichment activities. We like the size of the small apartment she has. The food was very good, and they have a chef. The Hearth at Greenpoint was very homey and open, and the people seemed to be very happy. I like the staff very much. I like the open airiness of it, and it was very light and cheerful. I had a terrible experience starting from the beginning in trying to help my mom find a place to move. The salesman was pushy and rest of the staff never even said hello. However based on location and my mom having a friend there we tried it out and realized it was a bad decision. The food was not good, the medications were forgotten a number of times and the aides were very rude. Thank you for your feedback. We are sorry that you did not have a positive experience with us at The Hearth at Greenpoint. Please contact me to discuss your thoughts and concerns. Sincerely, Mark Guida, Executive Director. My brother and his wife are in assisted living at The Hearth at Greenpoint in a very nice two-bedroom apartment that's smaller than their home, but they're getting used to it. It's a very nice facility, and my brother and his wife are doing OK. They have the help that they need, like the food, and are very happy. The people there were really nice. There's a cleaning crew where somebody comes in and cleans once a week for everyone. I have met a couple of them, and they were very wonderful and nice. The woman who showed us the whole thing was great and wonderful and answered all of our questions. The only thing that I know that my brother and his wife are not really thrilled about is the wait time. They're both in wheelchairs and the dining hall is quite a distance from their room, so they need to be transported and have to wait quite a while for transport. They're getting some therapy right there on the premises, and they take them to the doctors offices if they want to go. They're safe now, and we're happy that they're there. The dining area is like a wonderful restaurant. The chef is someone who previously owned a popular restaurant in the area. My brother and his wife don't have any complaints about the food at all. There's the same choices every day, plus specials, too. They have breakfast and dinner included in the rent. It's reasonable. There are also activities every day. The staff was wonderful and the rooms at the Hearth of Greenpoint were very nice. They looked brand new and were equipped with everything that you would need. The atmosphere seemed very good; there was a lot of interaction with everyone and a lot of things to do. The Hearth at Greenpoint was very nice. We were really impressed. The atmosphere was very friendly, and very nice. The staff people were very solicitous, and they called us back a few times asking if we’re still interested. My mom has been in The Hearth at Greenpoint for several years. The staff seemed attentive to the residents. The rooms are adequate and seemed to be kept up well. I have not had a meal there, but they are willing to accommodate my mother's gluten free needs. She has celiac disease, so they do accommodate that dietary requirement. The dining room is nice. I can't say a lot in detail because I just took a quick tour one time. When I'm visiting my mom, I'm there for such a short period of time that we don't even go down to the dining room. But from what I have seen of it, it is clean, and it seems like a very good feel as far as the atmosphere for older folks. It is decorated in the way that they find comforting and to their liking. They got some occasional live music that comes in to perform. They go on field trips several times a week for community outings. They have the usual doctor's appointment run, grocery stores, or bank runs. They do have transportation to some church services, and they host a church service there at the facility. They have the Wii bowling, and I'm sure they play bingo. They have special events, and on occasion they celebrate the holidays. They have like a family picnic in the summer time where all families of the residents are invited to join. As far as assisted living facility, I know that Greenpoint has a fairly good reputation, but I think what they often run into at this place is the short staff and the quick staff turnover within the dining room and some of the office staff. I think they are stretched somewhat thin at times. The couple of the staff members we have had seemed like they really care about the resident's wellbeing. Dad has been at greenpoint for a year now. He is not very happy there. The most serious complaint is there extra services or ADL's. ( activities of daily living services.) they do a poor job on personal services. The staff are poorly trained. They seem to work on their own schedule and at their own pace. Dad waits a long time for his daily scheduled services. They rarely stick to any type of a schedule. The service is what the individual decides to give. 2nd is the food service. I see that some people seem happy with the service. All I can say is that the dining service has been a serious bone of contention since Dad arrived. I have had personal contact with Jeff, their head chef, and was assured that the dining arrangement would no longer be a problem. That was four months ago and nothing has changed. They "Talk the Talk " but they don't Walk the Walk". I am sorry about your negative experience with us. While we understand your concerns and frustrations, we consistently strive to screen, hire and train the best staff possible. All of our care staff are either Certified Aides or Licensed Nurses. They undergo extensive training prior to becoming a part of our team. Additionally, we provide job specific training to them as part of the on-boarding process, as well as, monthly in-service training to further enhance their skills. Should you have any specific concerns about our food service, we will do our best to try and accommodate any special requests. Please contact me at the building, 315-453-7911 if you would like to discuss it further. We’ve been very pleased with The Hearth at Greenpoint for my aunt. The staff are very upbeat. When we ask for something they respond immediately. There is nothing really negative I can say about it. She has a one-bedroom apartment with a small kitchen, but big enough for a small two-person table that you could fold out. It was very adequate for her needs. They supply breakfast and dinner, and if you want to pay an additional fee, they will supply lunch too. It has a very nice living room that fits all her furniture. There is a sliding door that will come out to a small patio, big enough for two chairs and a table. She really likes that and she spends a lot of time there. It has a very nice view. The bathroom is a very good size with a walk-in shower. We had lunch once and the food was very good. When I was there, everyone was really nice. With their activities, from what it sounds like, it's fantastic. They take you to three or four different grocery stores so that you can go to the one that you are used to. We are looking at Greenpoint. I went on a tour, and my mother's excuse was it's too fancy. It's independent, but you can get assisted there. They have nursing there that you can get that will do medicine management, transport, help mother get up in the morning and go to bed at night. There was some help. It was beautiful. If my husband and I were looking for a facility like that, that is where we would go. We were very impressed with the cleanliness, with the staff, the apartment, the size of the apartment, the restaurant. There were many, many pluses there. You can have an apartment being independent, and at some point, if you need assistance, you can stay in your apartment and get the assistance. The rooms were spacious. You could get up to 2-bedroom apartments. Some had balconies, which were lovely. The 2-bedrooms had a bath and a half, and there was a kitchen that was not bad. It was pretty good, a nice size for that type of setting. Cable was included. The grounds were very, very lovely. They were getting a little putting green together for the guys that liked to putt. The pricing was very reasonable. The meals were excellent. My husband knew the chef there, and the menu looked wonderful, nice selections. She's been at the Hearth for a week now. We feel that she liked the amount of people around. There were lots of people outside. It seemed like they would definitely try to get people to get out and do some activities, such as going to the community rooms and doing things together -- to visit and socialize. I think that was the big thing that's truly the deciding factor for her. It's very happy. She says she loves the food; it's delicious. She says she's making friends. We feel comfortable that people are watching her and everything seemed very nice there. The other day, they were out playing some sort of game. She enjoys the socialization and the amenities that they provide. She seemed to respond to what she was seeing there. The Hearth at Greenpoint is a nice facility, but it was not what we were looking for. Mom doesn’t want an assisted living facility. The staff seemed very nice. From what I saw, the people seemed nice too. 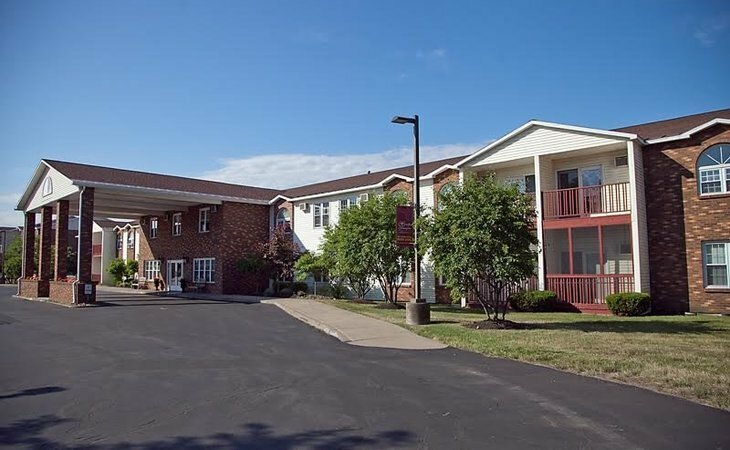 I would recommend this place to people looking for apartments with assisted living. WAS NOT GOOD!! MY MOTHER WAS HERE FOR ABOUT A YEAR WHEN THEY "DUMPED" HER! EVERYTHING I'VE READ BEFORE HAND & NOW SAY THAT THEY'RE "ASSISTED" LIVING. WHEN THEY MADE HER MOVE THEY SAID IT WAS "NOT" ASSISTED LIVING, BUT ONLY INDEPENDENT. SO WHAT KIND OF FACILITY ARE YOU?? SHE PAID FOR EXTRA ASSISTANCE & USUALLY DIDN'T GET IT. THEY WANTED HER TO GO TO THEIR MEMORY UNIT, YET 1 1/2YRS LATER SHE STILL DOESN'T NEED IT. NOT HAPPY WITH GREENPOINT. I am sorry about your negative experience with us. We offer both Independent and Enriched Living. Please feel free to contact me at the building, 315-453-7911 if you’d like to discuss it further. The tour at The Hearth at Greenpoint was fine, but I didn't care for the people I met, except the tour person, who I did like. She has continued to send short emails about the different aspects of senior care, which is good. She actually helped me more with the idea of the payment. I thought she was very good. The rooms were fine, but the community is too big for my brother, and it's farther away from where I live. My friend thought she liked The Hearth at Greenpoint. At first I thought it was too good to be true and it was. They offer lifestyle enrichment, which is a package where you can have different services. From what the salesperson told me, my friend was going to have one free month of this enriched living service. However, it wasn't free. We should have read every single line of that paperwork and we didn't. My friend is not happy there at all. They just took all her money, so it's really bad. They're not very nice. I wouldn't recommend anyone go there unless they have a lot of money. I think they need to improve their communication and I think they need to be more honest about their amenities. They need to be more honest. They need to put everything on the table, including how much it's going to cost. It was horrible. My friend has a dog, they told her she could bring the dog and it wouldn't cost anything. Then I found out that they're going to charge her if the dog moves in. My friend gets two meals a day. She really isn't able to go down and get her meals, so they have someome bring them to her, but they're charging her for that too. She said the food is good though. Hello and thank you for taking the time to indicate your concerns. We do apologize for our delayed response, however, I believe that we have discussed these matters in person shortly after this was posted. If you would like to speak further regarding this or any other matter, please do not hesitate to contact me and I will happy to assist you in any way I can. Thank you. The Hearth was fine, bigger, but we thought it would be hard on my mother in law. The setting was more urban, with buildings, parking lots, and not a lot of greens. The lady was very informative, and the people there were nice. The amenities looked suitable. Welcome to The Hearth at Greenpoint, an independent and assisted living community. Relax at home situated near the charming village of Liverpool, NY, and the neighboring city of Syracuse. The Hearth at Greenpoint provides the best of central New York with its exquisite lifestyle, nestled in a safe neighborhood setting, which provides comfort and convenience like no other. We offer a variety of spacious apartment floor plans with balconies and beautiful courtyard views that we are sure will fit your needs and make you feel right at home. At The Hearth at Greenpoint, we love holidays. When there are no holidays in sight, we find all kinds of reasons to celebrate with special events and festive food. Our senior living community is designed to offer you a maintenance-free lifestyle so you can pursue your interests. If you require a helping hand, it's there, almost before you knew you needed it. If a little more assistance is needed, an easy transition to enriched Living is possible, without ever needing to change apartments. Through our warm and welcoming, purposefully designed environment, as well as a full range of services, amenities and activities, residents have countless opportunities to pursue their passions, find purpose and fulfillment, and feel proud to call The Hearth&reg home. The Hearth At Greenpoint, overlooking Onondaga Lake in Liverpool, offers easy access to shopping, medical services, and cultural activities. Our senior residents enjoy studio, one, or two bedroom apartments without the burdens of home maintenance. Some of the hospitality services that we offer include: Breakfast and Dinner served daily in our elegant restaurant, weekly housekeeping, utilities, 24-hour staffing, emergency call systems, local transportation, and maintenance services. What should caregivers and potential residents know about The Hearth at Greenpoint?